Pantries offer premium real estate in the kitchen, but like the closets in your home they can quickly become a catchall. If your pantry is starting to look like it was ransacked by a pack of wild, hungry teens these four tips will help you get things back in order. Start with the expiration date – The quickest way to clear out pantry clutter is by chucking anything that’s passed its expiration date. It’s usually found on the bottom of the container or around the lip of the lid. When in doubt, throw it out. Stock shelves like the grocery store – Have you ever noticed that the less popular and extra items are usually on the top shelves of grocery stores? Grocers reserve their eye-level, easy-to-reach spaces for items that are commonly used. Doing the same in your own pantry will make it easier to grab the items that you use the most. Don’t forget – labels out! Create zones – You can take shelf stocking a step further by establishing zones. The zones can be based on food type, the meals you plan to make, preparation style – whatever works for you and makes the most sense. Organize the zones so that the items you use the most are in easy reach then label each zone so the whole family knows where everything goes. Invest in organization – Containers make the world a more organized and enjoyable place to live. Nowhere is this more evident than the pantry. A spice rack immediately transforms a mess of bottles into neat rows of seasoning. A hanging basket affixed to the bottom shelf expands your storage options. Stackable, plastic containers help you use the vertical space of each shelf while keeping food fresh. Baskets and bins keep all the ingredients of a meal together. One trip to the Container Store and it’s easy to see the possibilities are endless. Need more motivation for pantry organization? The entire month of November we’re helping customers clear out the clutter in their pantry and support a great cause at the same time. 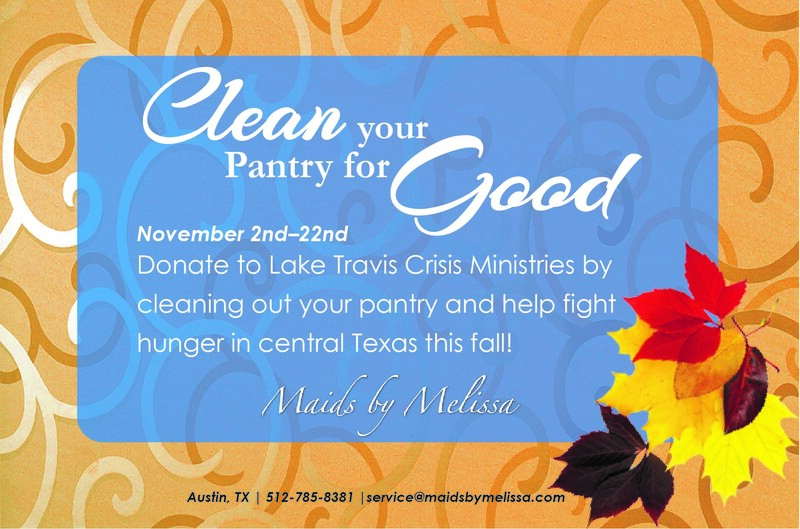 Maids by Melissa is teaming up with Lake Travis Crisis Ministries to collect donated food items for families in need. While you’re cleaning out your pantry, set aside food that’s unopened and not yet expired. Give us a shout, and we’ll come by to pick up your donation. You’ll have a fully functional pantry and the added satisfaction of knowing your extra food won’t go to waste! 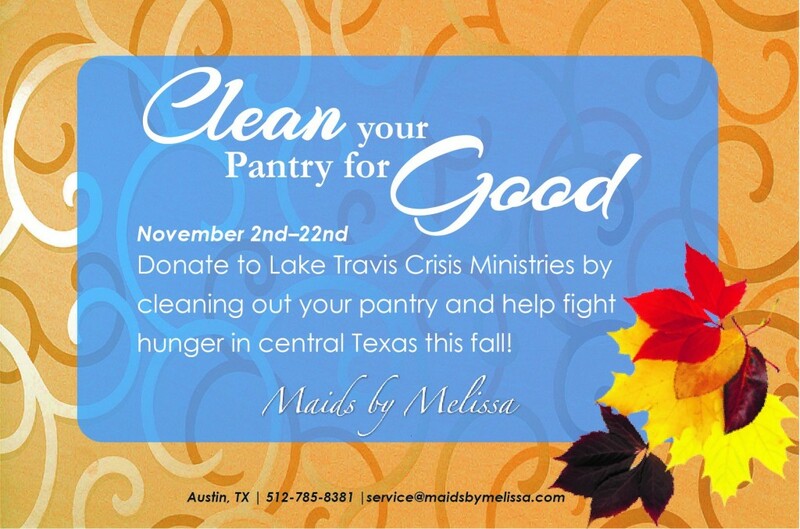 Clean out your pantry for GOOD this November!